The final season of this “ever-sparkling comedic drama” (The Guardian, Australia) tackles the contentious world of politics, with disbarred lawyer Cleaver Greene (Richard Roxburgh, Moulin Rouge!) having won an Australian Senate seat on a campaign promise to do nothing. But even Cleaver’s low expectations fall short of the absurd reality, as he contends with a right-wing nemesis (Jane Turner, Kath and Kim), a noxious gas attack believed to be the work of terrorists, and a disastrous visit from the US defense secretary (Anthony LaPaglia, Without a Trace). Can Cleaver outmaneuver his cutthroat colleagues, or will his self-destructive behavior destroy his budding new career? 5.0 out of 5 starsRake 5 just feels more outrageous to me. It’s like 8 episodes of political jokes put to comedy/drama format. What’s not to like? 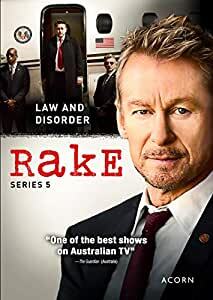 Yes, for this last season, the very last, Lawyer Rake has won as Canberra Senator in the Aussie government. The ongoing cast supporting Richard Roxburgh as Rake keeps it quirky and entertaining. Well a bit over the top, surely, even down there in Sydney. Only Rake/Greene can manage to get himself involved to a shameful proportion. Sensitivity warning: Crude scenes/ topics, language, violence, frequent blasphemy, drugs, skin, – adult series to watch while wrapped in a plain brown wrapper. Once you buy into Rake’s excessive rudeness, it’s a briefcase full of laughs. 30 nominations and 8 award wins says RAKE’s doing (DID) something right. Greene v The World ==New Senator Greene flops a speech before a terrorist hit. Greene takes to politics with a world of enemies. Greene v The United States ==Def Sec goes AWOL thanks to Greene’s raucous caucus. Peace treaty harmed by Greene’s character woes. Evans v Greene ==Zebra costume remakes the Senator Greene profile for a parliament speech. Gold and Greene v Red ==On Anzac Day Greene gets served and a new press secretary. Greene v Diaries ==Greene’s empty work diary disclosure isn’t in the public interest-among other chaos. Greene v The Unflushables ==Greene’s stool eruption allows the gas-attack cover-up to get flushed out. Greene v The Reckoning ==Political meltdown & a finale of Greene; and Rake is no more. The eight-year five-season run of outrageous judicial injustice gets the Judge’s hammer leaving a cult-following whimpering for more.